Joe Scarborough is fed up with his critics. "I am sick and tired of people misrepresenting me and making snide assumptions and giving readers false conclusions," the "Morning Joe" co-host told CNNMoney on Monday. In 2017, he said, he was "going to war against lies." One night earlier, Sopan Deb, a CBS News reporter who will soon move to The New York Times, tweeted that Scarborough and his "Morning Joe" co-host Mika Brzezinski had "partied with Trump" on New Year's Eve, linking to a Times report noting their attendance at the party. On Monday, Maggie Haberman, the author of that report, tweeted a photograph showing the co-hosts talking to a tuxedoed Trump before the party. To many political journalists, Scarborough and Brzezinski's presence at Mar-A-Lago confirmed their suspicions: The co-hosts were far too cozy with Trump, trading favorable coverage for access. Scarborough had made no secret of his long friendship with Trump, or even that he occasionally gave him political advice, and now critics say he and Brzezinski were enjoying the perks of that friendship. Even Chuck Todd, the NBC News political director and moderator of "Meet The Press," sent out a tweet that was widely interpreted as being directed at Scarborough: "It really stinks to watch others continue help ruin the reputation of your industry," he wrote. After Scarborough responded, Todd tweeted again: a link to a video of the song "Let It Go." Scarborough sees what he does differently: For generations, he says, journalists from Ben Bradlee to Andrea Mitchell have had friendships and social relationships with the politicians they cover, and many political reporters have drinks, dinners and other off-the-record meetings with politicians and political operatives. The only reason Scarborough has been targeted, he says, is because the politician in this case was Donald Trump. "The only difference is that Donald Trump is now the person calling us up," he told CNNMoney. In an effort to set the record straight, Scarborough agreed to an interview with CNNMoney on the condition that it be recorded, transcribed and published in full. (It has been edited in places solely for clarity, removing some repetition and common verbal tics.) 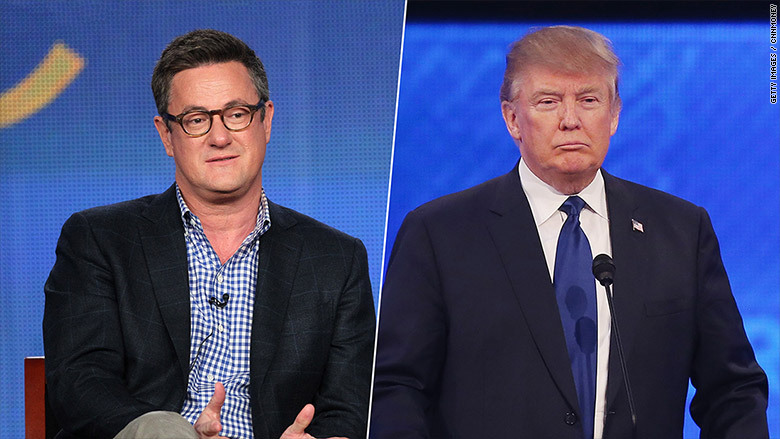 In the interview that follows, Scarborough tries to make the case that his approach to Trump is no different from how political journalism has been done for years, and describes himself as a "political analyst" who is capable of providing fair and honest coverage while maintaining friendships with some of the most powerful people in government. "Basically I look at myself as somebody that is in a position that John Madden was in when he was on TV analyzing NFL football games," Scarborough said. "I'm a news analyst and a political analyst. That's why I get paid really well by NBC and that's why I tell it the way I see it and why Mika tells it the way she sees it. That's what we get paid to do." BYERS: Obviously you feel like there have been a great deal of assumptions made about what's going on in the [New Year's Eve] photograph. I'd like to hear your version of what's going on in that photograph. SCARBOROUGH: Well, by this point there really shouldn't be any assumptions. I stated very clearly last night in my Twitter feed, in numerous tweets, that we had asked to meet with the President-elect to discuss an interview around the time of the inauguration and were told to be there at seven o'clock on the 31st. So we showed up at 7'o clock in street clothes. At Mar-A-Lago there are usually several entrances. The Secret Service had shut down all other entrances, so there was only one gate where they screen your car. We went through that gate then were told by the security guards to meet the President-elect up the stairs at the hotel. So we walked in and did our best to walk around the group that was hanging outside the ball room where the party was going to be later that night. We walked around, walked through the crowd, were guided through the crowd by a security person, and then got to the foot of the stairs and the security person called for Donald Trump to come over and he waved us over and introduced us to a 10-year-old boy who he said was the best 10-year-old golfer he's ever seen. We sat there and talked to the young man for about 30 seconds, shook hands with his mother, and then we went up the stairs. The picture that somebody must have taken on the iPhone shows us right at the foot of the stairs while we're talking to Trump and the young boy. Then we headed up the stairs, had about a 10 to 15 minute meeting, and then left. What did you guys discuss in that meeting? Well, we did what anybody at CNN or The New York Times or 60 Minutes or any other news agency would do. We talked about an interview, that we'd like to set up an interview with him around the time of the inauguration. Obviously there have been a lot of tough things said on both sides. A lot of very rough columns that I've written in the Washington Post about him. He obviously tweeted some very personal attacks toward both of us. So I'm sure there is not yet quite a comfort level there to come back and be interviewed again. Part of it, as you know, even in dealing with somebody as small as me in setting up this interview, you go back and forth, and make sure you're going to be treated fairly, just like you have to make sure that you're going to be able to ask whatever questions you want to ask, and get a comfort level. And in fact, the back and forth that we had before this interview is basically part of the process that we've been going through to try to get an interview for the inauguration. And is the reason to do that in person, rather than over the phone, is because you need to be in person in order to establish that level of comfort? Or did you just happen to be at Mar-A-Lago? No, I was actually staying with friends up in Jupiter, Florida, but yeah. Obviously for something this big, I can't imagine Leslie Stahl or anybody else settling for a phone call when they have an opportunity to go talk face to face with him and talk about the interview. Was there any other time that you met with Trump over the course of last week? Yeah, I met with him one other time earlier, with just me and him. We met a couple of nights earlier and talked. We went back because Mika was going to be involved in the interview, and he said that he wanted to meet with Mika as well. That was really the premise for the follow-up on the 31st. Because they obviously had some very tough exchanges back and forth, and I think they just wanted to talk through those. We were also sent a picture of you with Trump and Fabio, [the fashion model], that was dated on Friday night. Did you meet with him then as well? Yes, that was the night I met with him. I met with him that night on the 30th. I talked with him and after that left and went back. He had actually asked that Mika come that night, and she was not able to come that night. Apparently he wanted to have both of us there and talk to both of us about it. Was there a reason Fabio was there, or was that happenstance? Oh, I have no idea why he was there. Again, I was walking up the stairs, through that dining area to a back room. So I don't know why he was there. Sylvester Stallone was there, and there were a lot of other people there. But it was just me walking through there. So I have no idea why he was there. I don't think Fabio was looking for an interview. No, I doubt it. So this gets to the tension between you and your critics, which is: Journalists have always had to negotiate some level of access. You only have to look at the White House Correspondents' Dinner. And journalists do go to parties and do dine and have off-the-record meetings with politicians and political operatives. That said, there are not pictures of, say, a Sopan Deb or a Maggie Haberman with Fabio and Trump. There are not pictures of them going to a New Year's Eve party and talking with Trump. So the optics have created this tension where there are a lot of criticisms of you and assumptions being made of you. There are assumptions being made of me. But I am sure that if you took pictures of, let's say Tom Friedman or Fareed Zakaria or E.J. Dionne or David Ignatius or other journalists that went to state dinners that Barack Obama invited them to. Or, I'm sure if there were photographs of, let's say, Thomas Friedman golfing with Barack Obama, or Fareed Zakaria repeatedly hanging out with Barack Obama, or Fareed Zakaria actually sitting in the White House and having lunch or having dinner and advising Barack Obama on foreign policy -- well, I would say I'm sure there would be questions raised about that too, but actually there haven't been that many questions raised. What do you that attribute that to? Well, what do you attribute that to? What do you attribute to the fact that until two nights ago I had spent more time and had a longer meeting with Barack Obama one-on-one in the Oval Office than with Donald Trump? What do you attribute that to? How do you explain that Fareed Zakaria regularly called Barack Obama, and Barack Obama regularly spoke to Fareed Zakaria to give him advice about foreign policy, and you never heard any outcry about that. And yet, I talk to Donald Trump over the phone once or twice a week after he's elected and it's in the lead of the New York Times and suddenly it becomes this great scandal. This is the thing that is so frustrating to me: Far from being a new phenomenon, this is something that's been going on since newspapers began being printed. There are the stories of Joseph Alsop busting down a door in L.A. at the 1960 convention, badgering John Kennedy to select LBJ as his running mate. Walter Lippman bragged about giving advice to LBJ. So on that aspect of it, actually, I socialize with politicians far, far less than the overwhelming number of people who report -- whether you're talking about Andrea Mitchell or Elisabeth Bumiller or Chris Matthews or, as I said, Fareed Zakaria or Thomas Friedman. All you have to do is look at Politico's calendar of events and every night of the week you have politicians getting together at parties at fundraisers at public functions and spending a hell of a lot more time mingling with politicians than Mika or I ever have. So you actually tell me: Why is it so shocking when we do it to a far lesser degree than people have done it with Barack Obama over the past eight years. Why isn't that a story? They had off-the-record meetings time and time again. I didn't see a huge public outcry when they would call reporters in and constantly have off-the-record meetings. I didn't hear a huge public outcry back in the 1990s when Mike McCurry would hold off-the-record meetings with Bill Clinton with journalists. There was no huge public outcry then. There is no huge public outcry because Andrea Mitchell has been at the center of the Washington social scene for decades. There's no huge public outcry that Tom Brokaw goes golfing and hunting and fishing with Supreme Court Justices and administration officials and had the inside track to the Reagan administration. There was no huge outcry that Katharine Graham, when she was publisher of the Washington Post, was, was one of Nancy Reagan's best friends and regularly had dinner with Nancy Reagan and Ronald Reagan. There's no huge outcry that Ben Bradlee actually was a running buddy with -- not a running buddy, but [laughs] -- ran around with JFK. There is this, there's this famous quote back in the '60s by Douglas Kiker, who was at NBC, and he said something along the lines of, that if a bomb ever went off at Hickory Hill where Bobby Kennedy lived, three-fourths of the most powerful print and broadcasts journalists would have died. This has been going on forever. Bob Woodward had Gary Hart live at his house. Again, I'm not questioning anybody's integrity here. What I am questioning is, either the complete ignorance of how journalism works, and how people make contacts and how people set up big interviews, or just a willful bias, or an attempt to lie and pretend that this is the first time that anybody's ever met with anybody else to try to get an interview. And do you see that bias as being against Trump and therefore any journalist who associates with Trump? Or do you see that as being a bias against you, or you and Mika? I think it's mainly against Donald Trump. Again, people knew that we went in -- we couldn't explain what we had said with Barack Obama, but when we met with him in the White House for an hour and a half, people knew we went in and met with Barack Obama for an hour and a half. They knew that we were friends with Valerie Jarrett. They knew that we had dinner regularly with Valerie Jarrett. Valerie Jarrett even admitted that she thought that they had to fire Stan McChrystal after watching "Morning Joe." They watched it every morning, and she said it had a huge impact on what they did. Having somebody call me up and ask my opinion of what they should do is nothing new for me. Just like Fareed Zakaria said it wasn't new for him when Obama did it. It's just, it's been, you know, I had the Clinton campaign at one point call me up and ask me what they should do with the Clinton Foundation, and said, "If we did this, if we put it in a blind trust, is that something that you think would pass the sniff test for most reporters?" It happens to me every day and it's been happening to me every day since "Morning Joe" started. The only difference is that Donald Trump is now the person calling us up. So for some reason, this is now shocking and everybody's aghast when the fact is, again, my interactions with Donald Trump are so much more limited than Fareed Zakaria's with Barack Obama or Ben Bradlee's with JFK or Walter Lippmann's with LBJ, or -- you just go down the list. Or Chris Matthews with John Kerry. Or Andrea Mitchell with half of official Washington. Again, there's nothing wrong with that. I mean, Tom Brokaw went out hunting with Supreme Court justices. That's fine. And it's good for him to do that. And it's good to get to know them so long as you're willing to be tough. And I've got a year of op-eds that show just how brutally honest I can be towards Donald Trump and anybody else. So the laundry list of examples you've provided are all fair points and well taken. That hasn't stopped criticism, not just from [journalists on] Twitter but even from, for instance, the tweet that Chuck Todd put out. Which, he clearly seems to suggest that what you're doing does not reflect well on the media industry generally. Why, given the litany of examples that you've provided, do you feel like this is still a source of tension, even for folks that used to come on your show that are at your very own network? Well, I don't know if Chuck Todd was directing that towards me or the other people that were attacking. In fact, I responded saying I know that Chuck Todd is just as disturbed as me that people are actually lying and misrepresenting what happened. And I'm sure that Chuck, being the good journalist that he is, doesn't believe that, that reporters should misrepresent facts and not even pick up the phone, and call people who make sure they have the facts right. Some -- I'm sure Chuck is on my side on this one. Interesting. So, if you were not limited to 140 characters, what is the message you would like to send to Sopan Deb, Callum Borchers, Maggie Haberman -- what is your message to them? Well, I don't really -- well, you know what, actually, I do have a message. And it's something that we talked about this morning on the show, and we've been talking about for some time. That, don't let Donald Trump get into your head. Don't let him change the basic rules of journalism. You still pick up the phone, you still ask questions. Facts still matter. You still pursue stories that matter to people across the country instead of venting or trying to write the most snide tweet or the most snide article. The problem with the tweets yesterday are, you had somebody that wrote a story without calling me up and asking the question, "Were you an attendee of the party?" Because Maggie Haberman put me down as one who attended the party. And certainly left the impression that I was there as an invitee to the party, when the fact is, again, as I've stated on Twitter, I wasn't invited to the party. I wasn't dressed for the party. All I did was go through the metal detectors and walk down the red carpet. Which I had to walk down because they had ropes up and the Secret Service were on both sides of the rope. And then I made a beeline, as quickly as I could, around the the area where people had a reception before the party began inside, and went straight for the stairs -- stood, in fact, at this foot of the stairs with my back turned to guests because I didn't want to engage in conversation -- talked to a security guy and said, "I'm supposed to meet Donald Trump upstairs, can you please find out where he is?" And the security guard guided me over to Trump, and he's there, and we met, talked to the 10-year-old kid and went upstairs. So if, if somebody had called -- If Maggie had called and said, "Hey Joe, were you invited to the party?" Well, I could have explained it, and then you wouldn't have had me incorrectly listed as somebody among the revelers at the party. And instead, you would've had, I wouldn't have been part of that. And then there wouldn't have been a snide, false, misleading tweet after that saying that I was partying all night with Donald Trump, and oh, by the way, last year Donald Trump thanked Joe for his support. And then his follow-up tweet showed that he was actually not interested in the facts. That he had a narrative, a pre-existing narrative that he wanted to push, and he pushed it. So, if, if people would just pick up the phone and call and ask, then I can answer it, and there wouldn't be an entire new layer added to a false narrative that somehow I am doing something as a reporter in my coverage of Donald Trump that hasn't been done for the past 200 years. Is there any point though at which you worry about optics, or is there a point at which you say, "OK, maybe I shouldn't be at Mar-a-Lago. Maybe I shouldn't be anywhere near a party --"
Well, first of all, first of all, I didn't think that there would be a party going on at 7 o'clock which is a New Year's Eve party. I thought most of those things started at 9 or 10, and ended at midnight. So first of all, I was surprised when we showed up that there were people milling outside waiting to go in. And by the way, they were milling around the pool because the doors hadn't been opened yet for the, for the place where they go in and have their dinner. Uh, but no, I do. You know, I, my kids and I had gone to Mar-a-Lago for three or four years in a row. This was before we ever dreamed Donald Trump would actually run for president. We went there last year before we imagined Donald Trump would ever be president. And this year, there's a reason why we told the kids we couldn't go this year. And a reason why we stayed up in Jupiter, Florida, with some friends. Because there's no way I could have stayed at Mar-a-Lago, even paying full price as I always do, just because I didn't want to answer the question. But do I have any problem going and meeting with Donald Trump to try to set up a meeting? Or do I have any problem going to meet Donald Trump and talking to him and talking to him on background as I do regularly to see what's going on in the administration and try to get information? Uh, no. I don't. I didn't have a problem doing that with Valerie Jarrett. I didn't have a problem doing that with Barack Obama. I didn't have a problem doing that with George W. Bush. I didn't have a problem doing that with everybody else that I cover. It's what I do. It's what journalists do. It's what people at CNN do. It's what people at the New York Times do. It's what people at CBS News do. You've also talked about giving advice to Donald Trump about the debates. You said that on stage at the 92nd Street Y. Is that something you have also always done, to, you know, give advice? I would say I don't know why they call, but I remember when I was in Congress calling Maureen Dowd and Tim Russert and Chris Matthews. You know, politicians call journalists as sounding boards. Actually, not to interrupt you, I think the better term would be analyst. I'm a news analyst, I'm a political analyst, and I get paid by NBC to tell people what is happening and what is going to happen. That's how I see my job. And if I tell people what is going to happen or what might happen, "Donald Trump's going to win the Republican nomination," "Donald Trump has a shot of winning the general election," "Barack Obama's going to have a hard time shutting down Gitmo," "Republicans are going to win in 2014," whatever -- if I get those calls right, then I keep my job. And if I don't, I lose my job. And what is, what's so interesting, Dylan, is I was criticized last fall for having Donald Trump on the show too much and supposedly enabling his candidacy. By December, I was already saying on the air that I couldn't vote for him because of the Muslim ban. And when he did what he did with David Duke, acting like he didn't know him, I said it was disqualifying. When he said what he said about Judge Curiel, I said it was racist. And every time I was critical of him -- when he had the fight with the Khans, I was critical of that -- his approval ratings dropped. They didn't drop because I said it, they dropped because I found it offensive and a lot of Americans found it offensive. When he, let's say when he did well though in the closing weeks or months of the campaign and everybody was saying that it was over, I said no, I don't think it is over, I think he has a shot of winning. Again. I look at myself and maybe people will laugh at this, but I basically look at myself as somebody that is in a position that John Madden was in when he was on TV analyzing NFL football games. John Madden may have coached for the Oakland Raiders but if a quarterback threw for four interceptions he either needed to be critical of the Oakland Raiders or he would have lost his credibility and lost his job. I'm a news analyst and a political analyst. That's why I get paid really well by NBC and that's why I tell it the way I see it and why Mika tells it the way she sees it. That's what we get paid to do. OK, so I'll describe you as a news analyst and political analyst. But in addition to doing both the work of journalism and of punditry, according to Trump you have described the relationship between the two of you as a friendship and so has he. A) Would you now describe your relationship as Trump, would you say that you guys are friends, and then B) do you worry that by being friends with Trump it makes your analysis, it raises the possibility that people might suspect you of being more favorable to Trump because of that friendship. No, I call Claire McCaskill a dear friend. I'm critical of Claire McCaskill when I need to be critical of Claire McCaskill. I call -- called, when he was in Congress -- Charlie Rangel a dear friend. I love Maxine Waters. I could go down the list of Democrats and Republicans alike. Bernie Sanders is a friend that I worked with in Congress, going back 20, 25 years. If Bernie did something stupid I would say it the next day that Bernie did something stupid, even though he was a friend. If Bernie put out an incredible ad or gave a great speech, likewise I would say that he put out, you know, a great ad or gave a great speech. Valerie Jarrett is a dear friend of Mika's and mine, and she has been and she will be when she leaves the White House. Donald Trump, as I have said, has been a friend of Mika and mine for a decade, and he will be a friend, you know, I thought, you know, I wasn't so sure he was going to win the White House, but I always told him, as I've said publicly, we were friends before, we will be friends after, but Mika and I have a job to do. And you may not like what you hear, but we're going to do it because that's what we get paid to do. So do I like being critical of Claire McCaskill? No, I don't, and sometimes it gets rough, and sometimes I feel uncomfortable. I hate that I've been as critical of Barack Obama as I've been as far as his foreign policy towards Syria goes, because I know that really bothers Valerie Jarrett and I know we're going to be having dinner again soon, and it's always -- you know, it's a little uncomfortable on the human level, but I've got a job to do and Mika's got a job to do and if we stop telling the truth about people in politics who are our friends, that would include pretty much half the members of Congress and people in the administration. I mean, I've been either in Washington or reporting on Washington for 25 years, for half my life. And I know people down there. I just can't make exceptions for anybody, I can't cut anybody any slack, because if I do, then the audience will pick up on it. We don't have any teleprompters. There's no way to neatly write our way through a problem with somebody that we know. So, I mean, you know, it's interesting, I got attacked in 2009 and 2010 for being such good friends with Valerie Jarrett and David Axelrod from bloggers on the right. But, you know, even David Axelrod told me a great story that someone in his communications department said, "Why are you friends with Joe Scarborough? He's so tough on the president." And David said, "You should have seen how he was with George W Bush." David understood. Valerie understands. I guess Trump understands. That we have to call it like we see it, because that's why we get paid and that's how we pay our bills and that's how we pay our kids' education. So do you ever have second thoughts, that maybe because you cover and analyze these people, that you shouldn't be friends with Claire McCaskill, that you shouldn't be friends with Donald Trump, or do you think that more journalists, including your critics on Twitter, should work harder to become friends with the people they cover? I don't -- you know, I can't give advice for other people. It certainly helps to know, I say this as a former politician, it certainly helps for members of the press to know the people that they are covering. I do wonder, though, whether -- I don't wonder, I know -- some people do allow that to impact their coverage, some people do allow the desire for access to, especially at the beginning of administrations, and you noticed this at the beginning of the Obama administration, at the beginning of the Bush administration, suddenly there were all these rosy profiles on Karl Rove and Rahm Emanuel, because people wanted access. I suspect that Reince Priebus will have a couple of glowing cover stories, I know Jared Kushner already has, for access. But I think it's up to the individual reporters, whatever they're more comfortable with. We're very fortunate that we can be straight and we can be blunt and people still come on our show, because it's a show that a lot of influencers watch. So we're in a pretty unique position, fortunately. So I don't want to be telling other people what to do. I will say, though, that few people have questioned Andrea Mitchell's integrity or Bob Woodward's integrity or Tom Brokaw's integrity and those are people who were quite comfortable -- I could say Katharine Graham's integrity, Ben Bradlee's integrity, and all those people were people who were comfortable around the subjects they covered, and I believe for the most part called it straight. I suppose I could go back to school and try to be an accountant but I can't, I can't erase my friendships with everybody from Tom Coburn to Maxine Waters. You know, I've got as many Democratic friends in Washington, probably more Democratic friends in Washington, than I have Republican friends. And so when Elijah Cummings comes on and I talk about my good friend Elijah, then that's great -- but, you know, Elijah's somebody that I worked with really well, we did a lot of committee work together, and I absolutely love the guy, but when he was critical of James Comey after lavishly praising James Comey, we played that clip. And did I flinch a little bit? Yes, I flinched a little bit. But I was like, "Eh, Elijah has to know it's my job," and sure enough he did and he came back on. I suppose there's some people that might get offended by it, but I -- anybody that watches the show knows that we're pretty tough on all sides. First of all, on that view, though. What a lot of people on Twitter seem to overlook is that has been the norm. That is not the exception, that has been the rule from Ben Bradlee through Walter Lipmann through Tom Brokaw through Bob Woodward through everybody. That is the rule. Right, I know those examples. And those are great examples -- and, look, they're brand-name journalists who are familiar to everyone. That said, a lot of the journalists today, from places like the New York Times, the Washington Post, CNN, elsewhere, don't view what you're doing as journalism, they see it as coziness and access. So I'm wondering -- and, respectfully, I and I think many others read the tweet from Chuck Todd as being very much directed at you and not at your critics -- and I'm wondering, do you think there is a space for, do you think both of these journalisms have value, or do you think that others are just naïve? But I'm not as cozy with Donald Trump as the president of CNN has been for 15 years with Donald Trump. I do not go out and socialize with politicians as much as Elisabeth Bumiller and other members of the New York Times socialize with politicians. I do not go to dinners and charity events and other functions with politicians as much as all of these people who work for news agencies that you just mentioned do. That is one of the more maddening aspects of it, that actually Mika and I on the grand scale of socializing with people we cover probably come in in the like 3rd percentile compared to all of those reporters that I've mentioned, and a lot of reporters from the news agencies that you mentioned. I will say it again: just look at the Politico calendar every single day if you want to see how people from the New York Times and CNN and the Washington Post and just about every other major news outlet cozy up and go to events with politicians on a weekly basis. I don't do that! Mika doesn't do that! We do our job and for the most part we go home and we hang out with our kids. And why, in that case, if so many people do it, if everyone does it, why aren't there pictures of all sorts of different reporters being photographed with Donald Trump at Mar-a-Lago on New Year's Eve? Why aren't there stories of other journalists having a brief meeting with Donald Trump in his hotel room on the night of the New Hampshire primary? Why does it always come back to you? I haven't written that story. You know I wasn't the author of those -- you know I haven't tweeted that. Oh, I know that. But I'm saying, though, you're asking though specifically about, "Why are people making such a big deal about it?" Well, I was lied about. And you're asking me to explain why somebody mischaracterized what I was doing at Mar-a-Lago a couple of days ago. I think the question actually should be, "Why didn't you pick up the phone and call Joe and Mika and ask them why there were there? Why did you write a tweet that was false without having the facts?" You're referring to -- who are you directing that to? Well, Maggie Haberman wrote the story. And, uh, you know who, who sent the tweet saying that I was partying with Donald Trump all night. So those were false. So I'm not exactly sure why you're asking me to explain why they misrepresented what I had done, just like it was misrepresented a year ago that I was watching returns with Donald Trump, which became a narrative that people believed. That was false. To be clear about the record, I never said that you were watching returns with Donald Trump. But however -- I guess what I'm wondering, I'm not suggesting that the fact that you have become the centerpiece of this story suggests therefore that there is something specific that you are doing that is wrong, but it is interesting to me, and it goes back to this question of optics and perhaps this question of bias, if this has been going on for so long, if there are the Ben Bradlees and the Andrea Mitchells and the Chris Matthews, what is it about you that's so different? And I've asked you that before and you said it had to do with bias towards Trump, do you think it also has to do with a bias towards you? You tell me what's changed when I actually spent more time with the Obama people than Mika and I have spent with Trump. Uh huh. So the answer in your mind is Donald Trump is the difference. Let's have that debate. But you just can not say that what we're doing is any different than what we did in the early years of the Obama administration or what Fareed Zakaria has been doing for eight years with the Obama administration or what Thomas Friedman has been doing for eight years with the Obama administration. Golfing with Barack Obama, going to state dinners with Barack Obama, flying on Air Force One with Barack Obama. Do I question Fareed Zakaria or Thomas Friedman's journalistic integrity because they did that? No! I'm glad they had access, and I'm glad to know that when Thomas Friedman's writing a column he's actually talked to Barack Obama and has a better understanding of his thinking. But I don't see anybody writing stories about Thomas Friedman golfing with Barack Obama or flying on Air Force One with Barack Obama or golfing with Barack Obama. Mark Halperin went on Trump's plane one time and you seriously would have thought that he committed the gravest journalistic sin that's ever been. No, the media actually needs to look at themselves -- actually, media reporters need to look at themselves and ask why they are treating Donald Trump and the coverage of Donald Trump differently than other people. If they want to try to justify the attacks that way, they can do that. But it's intellectually dishonest, and it's intellectually dishonest to say that we are any chummier with Donald Trump and the incoming administration than we were with the Obama administration. It's just not true. Mm-hmm. I think that's a good place to -- sorry, go ahead. Can you imagine if I held, if Mika and I held three or four fundraisers for Donald Trump or any of his children right now? That's what we did for David Axelrod when he was in the White House. Nobody said anything about that other than, "Oh, that's nice. That was nice of you and Mika to do that." What if, what if I -- Melania Trump, or not Melania, Ivanka Trump was going to have coffee with somebody and get $75,000 for St. Jude's Hospital, something that she's been doing for years, and you would have thought that she had committed a crime against humanity. There is a blind spot, the media has a terrible blind spot, and it doesn't really bother me because the facts are on my side. But it does bother me, on a much larger scale, that the media -- and especially media reporters -- are being intellectually dishonest about covering the incoming president. So you said that in 2017 you're going to call out every single lie and that people, media reporters, myself, others, anybody who lies about you has been put on notice. Is that sort of a formal New Year's resolution for yourself that we're going to see on the show? No, no, and I hate doing it on the show because people don't tune in to the show to hear me battle people in the press that get things wrong about me. If they want that, they can watch Bill O'Reilly. That's not what we do. And I was really, actually, uncomfortable talking about it this morning, because I know when people tune in, they want to actually talk about things, or hear us talk about things, that actually impact their lives. People lying about me on Twitter do not impact people's lives. What Donald Trump's policies are going to be towards Russia, the minimum wage, Social Security, health care, that impacts other people's lives. So, no, I think, I think I'll probably do what I'm doing right here, and just, just answer questions and probably write some columns about it, but hopefully move beyond it. Fair enough. Thank you again for doing that, thank you for doing this, I know you didn't have to and you did and I appreciate it immensely. OK, well thank you so much for giving me a chance to do it, I appreciate it.